This fancy little puff sleeve dress is so adorable for your little cowgirl. Made with a hot pink bandana print bodice attached to a very full ruffled two tier cow print twirly skirt with a hot pink bandana print ribbon scrunched overskirt. 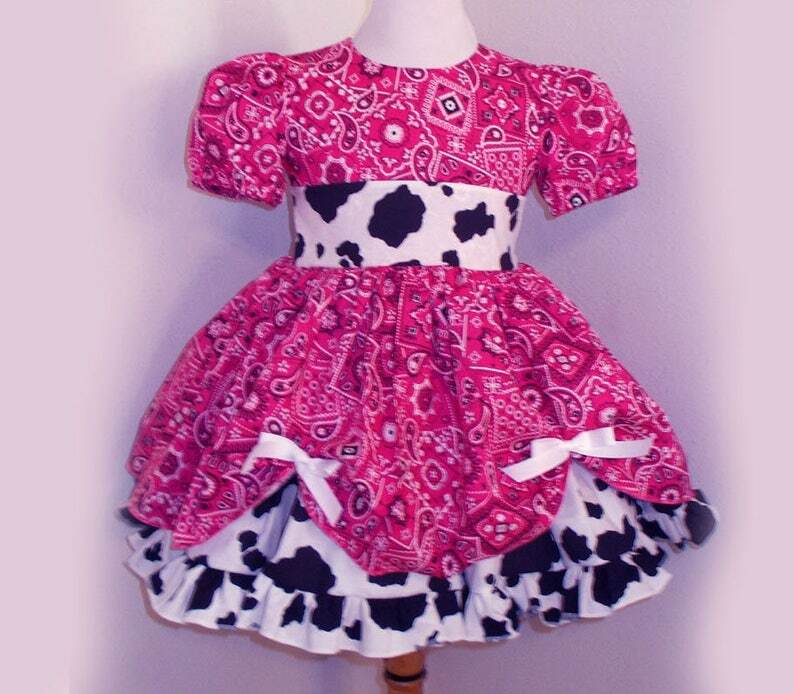 100% cotton dress has cow print sash that ties in a big bow at back waist. Skirt is made extra full for little cowgirl's twirling fun. Made in the USA. Also available in other colors: Pink Bandana, Red Bandana, Hot Pink Bandana, Lime Bandana, Turquoise Bandana and Purple Bandana. This sweet dress can be custom made with different color/print ruffles, and top. Let me know what you would like! 3-6 Month - Chest 19" - Waist 19" - Dress Length (shoulder to hem) 15"
6-12 Month - Chest 19.5" - Waist 19.5" - Dress Length (shoulder to hem) 16"
12-18 Month - Chest 20" - Waist 20" - Dress Length (shoulder to hem) 17"
18-24 Month - Chest 21" - Waist 21" - Dress Length (shoulder to hem) 19"
2T - Chest 22" - Waist 22" - Dress Length (shoulder to hem) 20"
3T- Chest 23" - Waist 23" - Dress Length (shoulder to hem) 21"
4T - Chest 23.5" - Waist 23.5" - Dress Length (shoulder to hem) 23"
5 - Chest 24" - Waist 24" - Dress Length (shoulder to hem) 24"
6 - Chest 25" - Waist 25" - Dress Length (shoulder to hem) 25"
7 - Chest 26" - Waist 26" - Dress Length (shoulder to hem) 26"
8 - Chest 27" - Waist 27" - Dress Length (shoulder to hem) 28"
10 - Chest 27.5" - Waist 27.5" - Dress Length (shoulder to hem) 29"
14 - Chest 29" - Waist 29" - Dress Length (shoulder to hem) 31"
16 - Chest 30" - Waist 30" - Dress Length (from shoulder to hem) 32"